If you need to print ID badges, student IDs or membership cards quickly, Wi-Fi connectivity can help ease the pain. It gives you the freedom from extension leads and excessive cabling. Your printer is no longer chained to a specific location because you can position it where the work needs to be carried out. Reduced Clutter: No more cords! Wireless printing enables on-site, on demand printing with minimal IT infrastructure, eliminating the expense and hassle of adding or moving cable. The Primacy WIFI feature is available as a factory-installed option only. Please call us on +353 (0) 1 460 2200 for more details. A new locking system is available, where a metal lock limits access to the inside of a printer and its consumables. This ensures that only authorised individuals can retrieve coded cards. It’s ideal where the plastic ID printer user is located in a separate setting to where the cards are being printed. The quality of the finished print on Evolis ID card printers is undisputed when compared to competitors like Datacard, Magicard, Smart and Zebra. However, speed plays a big part when you need to print quality cards quickly at events or professional conferences. 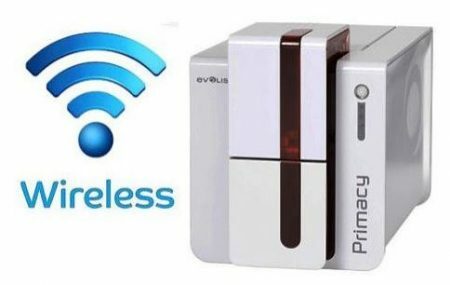 The Evolis Primacy Duplex is an eco-designed printer. The energy consumption is on average 5 times lower than printers from the previous generation and it operates prints at a low 48 db sound level, ideal for deployment into any working environment. « Previous post: New Solution for visitor Management!